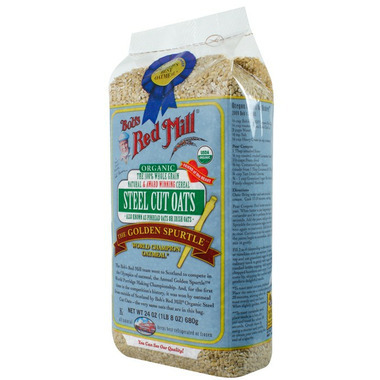 Bob's Red Mill Organic Steel Cut Oats are simply whole oat groats that have been cut into neat little pieces on a steel buhr mill. 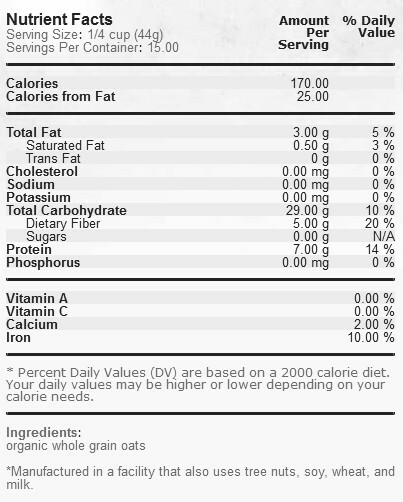 Bob's Red Mill Organic Steel Cut Oats uses high protein, whole grain organic oats that have been lightly toasted to create our hearty steel cut oats. Also known as Irish oats or pinhead oats, steel cut oats create a chewy, full-bodied hot cereal. Tired of what's in your pantry? Spruce it up with these healthy pantry staples found on our blog, The Well! I buy it regularly. It's healthy, delicious and the price is affordable. Great breakfast, good flavour and something to chew on. Will buy again. Very good quality, my family love it. We love these oats and it was getting increasingly difficult to find them in our area stores. I'm so glad we found them on Well.ca! Thanks for carrying them. We love these oats! We make a large batch once a week and have it ready for the mornings all week long. The oats have a crunch to them rather than the mushy instant stuff and this is super healthy and organic! We tend to buy the larger bag from Costco though as we go through so much. I made Bob's Red Mill Steel Cut Oats up at the cottage--the perfect breakfast for the north! The taste was nutty and a little bit salty (although you don't have to add salt). There was no need to jazz it up with sugar or fruit - the full taste stood on it's own. I didn't feel hungry after this hearty breakfast. I use this in a crock pot recipe for hot oatmeal with dried apples & cinnamon.